Our family of seven adults really enjoyed the stay at Casale il Melograno. The house was fantastic with splendid rooms and beds for all of us. The kitchen was well equipped and we all loved Cooking in these surroundings. The garden is placed in a sloping hill ending in a nice pool where we spent a lot of time swimming and playing different water games. In the small village Nocchi there were both a Pizzeria and a Restaurant in walking distances. They served well-tasting typical Italian meals and the servants were pleasant and also spoke English. In Camaiore, the closest town, there was a supermarket, street markets and a lot of different shops. We visited Lucca, Pisa and Lido di Camaiore and also spent one day walking in the surrounding mountains. We all give Casale il Melograno our best recommendations. Torill Johansen and Terje Fjeldaas from Norway. Annamaria's house is very well appointed and perfectly suited our group of friends. The bedrooms are well spaced, and could easily accommodate our mixed group (some couples, some singles, no kids). There are various common areas (inside and out), which gave a terrific sense of space (no-one felt crowded). The grounds are immaculate and the pool is wonderful - it gets the sun all day. Annamaria had various recommendations for local activities and restaurants, including a local chef (Romina) who came in to cook some superb meals for us. We ate all our meals outside, on a wonderful long table - either down by the pool or up at the house. The house is well situated to explore the local area - we went to Pisa, Lucca, Viareggio, Lido di Camaoire, Pietrasanta and Forte dei Marmi (by car) and also ventured to the Cinque Terre and Florence (in the train). However, we also spent a lot of time lounging around the house / by the glorious pool. Anna Maria's home was spectacular. Everything was as advertised and the pool was even better than expected. We were eight, 2 families, with 2 girls and 2 boys ages 12-16. Everyone had plenty of space. Beds were very comfortable. It was extraordinarily warm during our visit so the air conditioning in the bedrooms at night was perfect, but during the day with the windows (screened) open and the breezes blowing it was very nice. Nocchi is a nice quiet place with a couple of good and family friendly restaurants. I would recommend heading up to Pieve for a night or 2. There are 2 good restaurants up that way, only 5 minute drive. Nice day trips to Florence, Pisa, Lucca and Cinque Terre, but always nice to come back to the house, swim, play cards, enjoy the music system at the pool, nap, etc. Would have liked to stay another week just to do nothing, but that will be for another time. Without any reservations, I would recommend this for 2 families traveling together or even several couples. 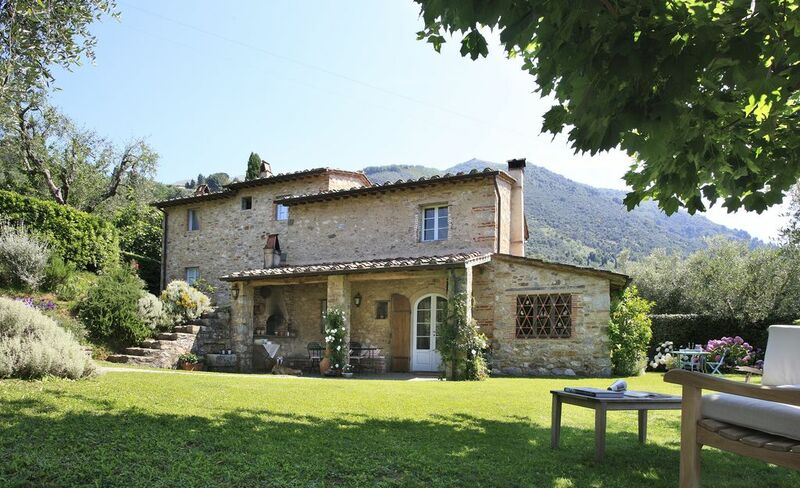 Great location and beautiful villa in Tuscany! I visited with family, friends and my daughter for 2 weeks. The gardens and ground are absolutely beautiful. Annamaria is a very attentive host and provided great recommendations for local Day trips, restaurants and a private chef to cook for us at the villa. I highly recommend staying here as it makes a perfect home base. You can’t go wrong. There were floaties and everything you need for the pool as well for afternooon fun. Beautiful villa, gardens and swimming pool. We had a great holiday and spent much of the time at the beautiful pool. The villa was very clean and comfortable. Only down side was big electricity bill to be paid on checkout even though we hadn’t used air conditioning or heating.